For some ladies, Robert Schwartzman will always just be the guy from The Princess Diaries. But others think of him as the frontman for a sun-pop west coast band about to release its third album DIY-style. The members of Rooney were barely out of high school when their self-titled debut emerged in 2003 bearing beachside hit Blueside, and from there, they were pegged as L.A. pretty boys honing Beach Boys harmonies and ’60s pop charm. When the industry began cramping their style, the band split from Geffen last spring to record and produce Eureka on their own through new label California Dreamin’ Records. Some things never change, because the follow-up to 2007’s Calling The World contains the same notoriously good vibes as all Rooney endeavors. Schwartzman claims to be “fat with regret” in opening track “Holdin’ On,” which chronicles his college years in New York, followed by an eventual return to the west coast and to music. But any regrets or identity crises are masked by buoyant energy in the guitars and signature crooning. They may not know who they are or why they’re here, but they’re hopeful. If the suggestion of “one less margarita, one more trip to the shrink” in the danceable (if slightly annoying tune) of “Can’t Get Enough” doesn’t appeal, the Magical Mystery Tour-like keys of “Only Friend” takes us on an interesting trip to the fringes of psychedelia. “Into the Blue” is an uncharacteristic slowdown – not the sunshiney pop of their last “blue” title song. The jingle jangle is brought to a momentary halt for heartfelt piano fare in which Schwartzman declares, “I send a thought to you from the prism of my mind.” Background harmonies again insist on the Beach Boys reference. 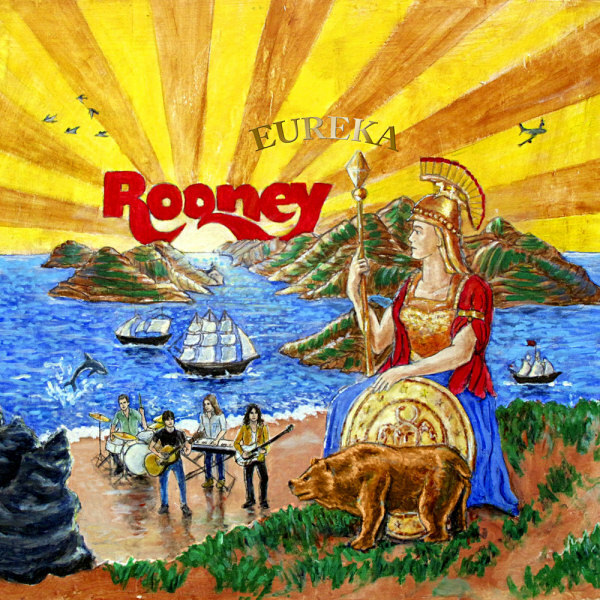 If Eureka has an outlier, it’s “Stars and Stripes,” which shys from the ’60s and ’70s pop Rooney has traditionally embraced. Like a modern version of The Youngbloods’ “Get Together,” this track embraces helping each other and sharing blame, oddly finishing with a key-driven melody that seems like an opener for some tawdry Vaudeville act. That, or the darker, harder rock tune of “Not in My House” that’s not quite believable. Eureka lacks the same level of up-tempo explosiveness present in the previous records, but that could have just been the boisterous nature of early, early youth. Rooney took it down a notch, but the melodies are still sweet and stick like honey. The album embodies the best parts of the band, like the impossible catchiness of “The Hunch” (montage time), or the meandering, feel-good guitar of “I Don’t Wanna Lose You” (pure prettiness). There’s something to be said for an ever-optimistic sound.